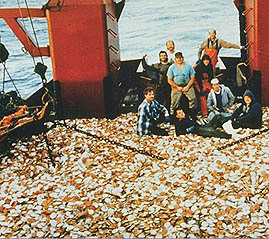 The sea scallop fishery is one of the largest in New England and the Mid-Atlantic. It is a specialized fishery, made up of larger vessels that are capable of remaining at sea for several weeks at a time. The sea scallop is one of the larger bivalve mollusks found in our waters, with a shell size sometimes greaters than 5 inches across. The U.S. market only accepting the large adductor muscles (those that keep the shell closed) of the scallops, these shellfish are shucked at sea and only the "meats" are landed. Because of the necessity to schuck the catch at sea, scallop vessels generally carry a crew of a half a dozen or more.